Toyon. One of the most widespread shrubs in California this plant also known as Christmas berry ranges right up to the Oregon State line and appears just inside our border. Large evergreen shrub with finely serrated large green leaves. 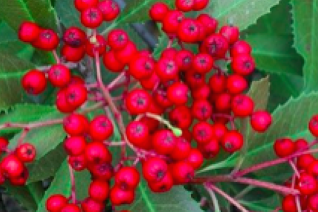 In late spring flat clusters of white flowers appear- they are pretty but nothing compared to the brilliant red berries that follow and ripen in early autumn- remaining showy through winter. Most often they are eaten by birds. AKA Hollywood this shrub is where that city got its name. heh. Fast growing to 13′ tall by 10′ wide in 10 years in our climate if left strictly unpruned. Slightly tender it requires a protected location. Most large established specimens I’ve seen around Portland are placed on the west or south side of large trees. They get the protection of the overstory and it shields them from the coldest winds. No water or regular water- either way, very adaptable shrub that really likes cultivation. Small tree in time. West coast native evergreen shrub for the mildest gardens. Oregon native plant.